In the midst of the summer heat, family gatherings and relaxation are probably leaving you reaching for not so healthy choices, such as numerous scoops of ice cream, overly sweetened lemonade, or store-bought pie. While a bowl of ice cream or ice-cold carbonated beverage may give you a nice cool-off, they definitely may give you a sugar crash, mood swings, and further cravings for junk food and sweets, too. Instead, fill your plate with snacks and meals as close to nature as possible. Reach for the fresh vegetables and guacamole dip, juicy watermelon slices, or even grilled salmon. Importantly, if you are the host, or bring a dish to share with your loved ones, take a step towards eating healthy by providing the healthy options yourself. Bring a bag of dry roasted cashews, a fruit platter, or even a unique salad, such as this chunky avocado salad. While the red pepper hummus dip recipe shared last week is an absolutely incredible choice if you are seeking a high-protein snack that will grant you satiety, this chunky avocado salad is also loaded with incredible benefits. 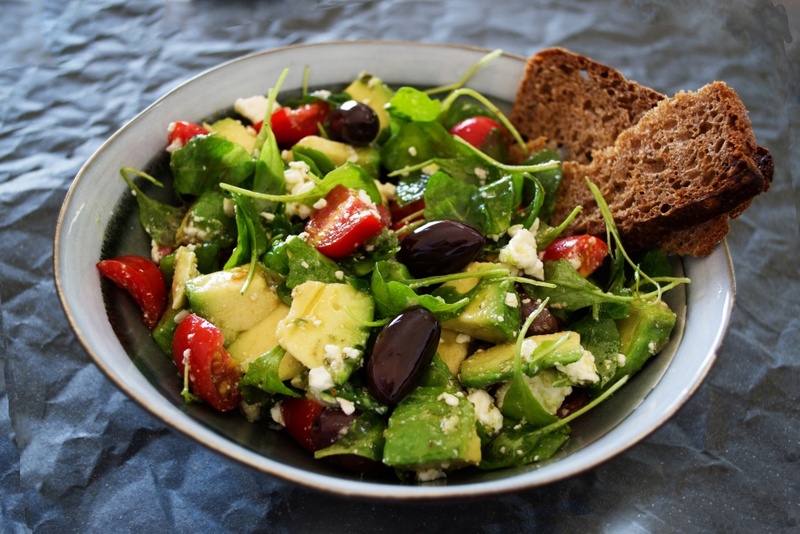 Not only will this salad grant you satiety for hours after consuming, due to the high-fat content of the avocados and extra virgin olive oil, but it will enhance your mood-boosting neurotransmitters, increase your energy levels and nourish your body with a myriad of trace minerals and vitamins. It’s a common concern of clients that avocados and extra virgin olive oil are high in fat and lead to weight gain. It’s crucial to note that not all fats are created equal, and in fact, good fats will aid you to lose weight while preventing cardiovascular health conditions, digestive health conditions, and cognitive health conditions as well. Healthy fats, such as extra virgin olive oil, avocados, nuts and seeds, avocado oil, fatty fish, avocado oil, and grass-fed butter are all incredibly beneficial to you in countless ways. When you eat healthy fats, you, in fact, will be full for much longer than reaching for “sugar-free” cookies loaded with artificial sweeteners, hydrogenated oils, and a myriad of chemicals. Atop that, consuming an adequate amount of healthy fats will balance your blood sugar, thus reduce the possibility of cravings after meals. Give this chunky avocado salad a try, and enjoy it as a dip or on its own. Feel free to add black beans, organic grass-fed cheddar cheese, and a bed of shredded lettuce or kale for a twist. Chop the avocados into ½ inch cubes, and place in a large bowl. Wash and chop the tomatoes into ¼ inch cubes, and place in the bowl as well. Finely chop the red onions and cilantro. Add to the bowl. In a separate glass mixing bowl, mix all of the dressing ingredients. Drizzle over the avocados, and use a serving utensil to gently mix the ingredients. Transfer to a serving dish. Refrigerate for 1 hour, as it’s best when chilled. Enjoy with organic tortilla chips or with a spoon! Making Healthy Choices at Barbeque Socials Making Children Suffer, Is this the New America?